This little origami box is useful for storing all sorts of treasures - and it is great fun to fold too. Once you have mastered the technique you will be wanting to fold boxes of all shapes, sizes and colours! If you fold a second box with a slightly bigger square of paper, you can use it as a lid. 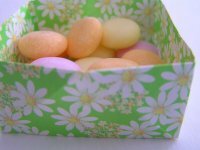 Turn the box into an Easter "basket" for storing eggs, chicks or chocolate - just glue on a stiff ribbon or length of card for the handle.